He secured first place in Category C (100-110cm show jumping), second in Category B (110-120) and third in Category A (120-130). BENGALURU: Who says equestrian is only for the affluent? The zeal to make it big opens many avenues. Take the example of Basavaraju Sangappa. Hailing from a low-income family, Basavaraju didn’t have the means to take up equestrian as a profession. But as fate would have it, he followed his dream since the age of eight. The now 23-year-old used to accompany his father, Sangappa, who was working as a security guard at the Embassy International Riding School (EIRS) and got hooked to how riders guided their horses over barriers. Eventually, he was attracted to the sport, but knew it was out of reach. However, his interest didn’t go unnoticed as Silva Storai, the director of EIRS, and Embassy Group chief Jitu Virwani decided to support the boy, and his journey began. At the EIRS, he started learning riding from two of India’s best riders – Ajai Appachu and Nadia Haridass. Under their guidance and later under renowned Kisnics Normunds, Basavaraju started flourishing. “I used to go with my father to the EIRS. I fell in love with the sport, especially with the horses. But I couldn’t afford the riding fees and that’s when EIRS started supporting me to take it up professionally,” he said. 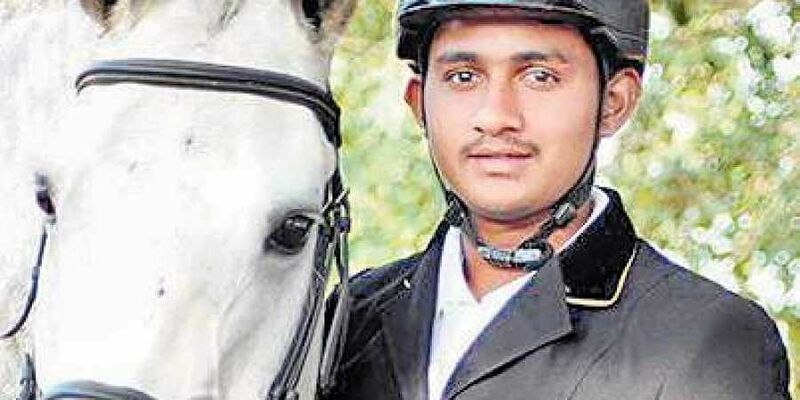 Basavaraju won his first national medal in the Junior National Equestrian Championship in Kolkata – team gold in show jumping – and also secured third place in preliminary dressage in 2010. A year later, the youngster secured first place in junior jumping in the National Equestrian Championship in New Delhi. Today, he’ is a proud owner of a bag full of medals at junior and senior levels. “Riding is not as easy as it may sound, especially when you have to guide horses over stiff challenges. You should have good communication with them. It’s been a continuous learning process,” Basavaraju said. But just medals wouldn’t do any good for sustaining one in this sport. He had to feed his family too. Basavaraju started instructing junior riders at the EIRS so that he could continue his training and studies. Realising his potential, he was sent to train in Germany last year, under former world champion and Olympic bronze medallist Bettina Hoy, who also trains Asian Games silver medallist Bengaluru’s Fouaad Mirza. Hoy was impressed with Basavaraju ’s talent. And the training he had in Germany paid off as he bagged three medals in the FEI World Jumping Challenge (South Zone) last month. He secured first place in Category C (100-110cm show jumping), second in Category B (110-120) and third in Category A (120-130). He now aims big and is far from being done. “The training in Germany was helpful but I have to improve. My target is to qualify for the next Asian Games in 2022. Once I am able to win a medal there, my aim will be to qualify for Olympics,” Basavaraju said.